Trust Company toll-free 1-800-509-5586 or visit http://www.continentalstock.com. 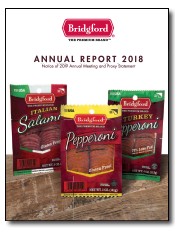 2018 was another successful year for Bridgford Foods Corporation. Strong growth in our marketing efforts, fine-tuning of our manufacturing operations, and changes in tax regulations will positively affect the future of our business. Sales during the 2018 fiscal year were up 4.2% at $174,257,000, despite having one less week in the 2018 fiscal year. Net income before taxes was $12,813,000, virtually even with the prior year and equal to $1.41 per share. After taxes, the company reported net income of $6,517,000, equal to $.72 per share. 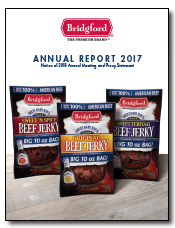 2017 was a pivotal year in the history of Bridgford Foods Corporation. Strong growth in both sales and income were accompanied by strategic developments that will impact our future for decades to come. Sales during the 2017 fiscal year were up an impressive 19.4% at $167,223,000. Despite higher input costs, net income before taxes also increased by 18.4% to $12,828,000, equal to $1.41 per share. After taxes, the company reported net income of $8,829,000, equal to $0.97 per share. 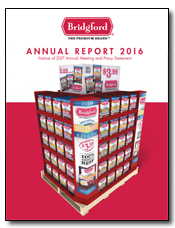 Bridgford Foods Corporation’s 2016 fiscal year maintained the impressive growth, progress and profitability we established in 2015, with pretax income reaching its highest level since the turn of the century. The strategies employed by the Company in reaction to a difficult 2014 fiscal year continued to reap benefits, as well as setting the stage for continued success in the future. 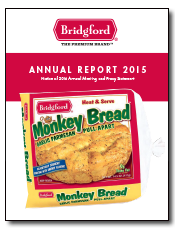 Bridgford Foods is pleased to report greatly improved financial results during our 2015 fiscal year. The challenges we faced during 2014 led us to re-evaluate our operations and make some difficult but important changes, and those adjustments were rewarded with the 4th best year in the Company’s 83-year history. As the year progressed, we benefited from declining costs in many aspects of our business, and those lower costs plus the elimination of operations that had been a drain on our finances in prior years produced great results. 2014 was a year of challenges and change for Bridgford Foods Corporation. Soaring commodity costs severely hampered our profitability, but despite our disappointing financial results we made significant progress in areas that leave us poised for success in the future. We discontinued two poorly performing divisions during the year that were not showing promise of a return to profitability. We achieved remarkable sales gains and price increases in our dry sausage and meat snack division that will enable us to take advantage of the inevitable return of reasonable raw material costs. 2013 was a successful year for Bridgford Foods Corporation, as the Company was profitable for the 4th time in the last 5 years. Commodity costs were relatively stable during the year when compared to 2012. Sales during our 2013 fiscal year were $129,003,000, an increase of 1.3% from sales of $127,355,000 in 2012, despite having one less week in the 2013 fiscal year. The Company recorded a net profit of$2,916,000 in 2013, equal to $.32 per share. 2012 was a successful year for Bridgford Foods Corporation, as the Company was profitable for the 3rd time in the last 4 years. Lower costs for pork and wheat, combined with higher sales and changes in marketing strategies, produced dramatically improved financial results. Sales during our 2012 fiscal year were $127,355,000, an increase of 7.7% from sales of $118,263,000 in 2011. The Company recorded a net profit of $3,651,000 in 2012, equal to $.40 per share. A one-time cash dividend of $.05 per share was declared by the Board of Directors on November 12, 2012. 2011 was a challenging year for Bridgford Foods Corporation. High costs for grains, meats and petroleum products offset the Company's achievements in the areas of cost-cutting and new product development, resulting in unprofitable results for the year. Sales during our 2011 fiscal year were $118,263,000, an increase of 0.5% from sales of $117,655,000 in 2010. The Company continued to eliminate unprofitable products and operations during the year, and continued a re-organization of portions of its dry sausage and meat snack distribution operations. The Company recorded a net loss of $443,000 in 2011, equal to $.05 per share. A loss of $1,675,000 related to an unsuccessful product line introduction hampered our financial results, as did monetary penalties imposed by OSHA and reductions in the surrender value of life insurance policies. Despite dramatic increases in the costs of key commodities, Bridgford Foods Corporation again achieved solid profitability in the 2010 fiscal year. Higher prices for grains, meats and petroleum products were offset by lower operating costs resulting from strategic changes implemented in recent years. Sales during our 2010 fiscal year were $117,655,000, a decrease of 4.1% from sales of $122,665,000 in 2009. The Company recorded a net profit of $4,319,000 in 2010, equal to $.46 per share. A one-time cash dividend of $.10 per share was declared by the Board of Directors on November 8, 2010. This Annual Report on Form 10-K contains certain forward-looking statements within the meaning of Section 27A of the Securities Act of 1933 and Section 21E of the Securities Exchange Act of 1934 and Bridgford Foods Corporation intends that such forward-looking statements be subject to the safe harbors created thereby. Readers are cautioned that such statements, which may be identified by words including ‘‘anticipates,’’ ‘‘believes,’’ ‘‘intends,’’ ‘‘estimates,’’ ‘‘expects,’’ and similar expressions, are only predictions or estimations and are subject to known and unknown risks and uncertainties. 2008 was a year of extraordinary challenges for Bridgford Foods Corporation, due primarily to the cost of grains, meats and petroleum products achieving record-setting levels during the year. Despite the implementation of price increases and significant cost–cutting measures, the increase in virtually every expense we incur in our business resulted in unprofitable results for the year. Bridgford Food Corporation experienced extraordinarily high raw material, fuel, utility and pension costs during the 2005 fiscal year. The 2005 annual meeting of shareholders will be held at the Four Points Sheraton, 1500 South Raymond Avenue, Fullerton, California at 10:00 a.m. on Wednesday, March 16, 2005. Bridgford Foods continued to face many challenges in 2003. Higher raw materials costs and strong competition in both the meat and bakery segments of our business reduced our gross operating margins. Higher workmen's compensation insurance costs, employee pension and medical charges, in addition to higher fuel and utility costs, added to our overall expense increases. 2002 was a difficult year for Bridgford Foods. The bankruptcy of a major customer, higher pension costs, higher bakery commodity costs and extreme price competition, as well as a soft economy, all contributed to lower sales and earnings. Also, the implementation of our new computer system resulted in approximately $685,000 in non-recurring expenses during fiscal year 2002. 2001 was a challenging year for Bridgford Foods. Our business was adversely affected by the recession and the tragic events of September 11. Sales reached a record level in 2001, but profits were down substantially compared to the prior year. Meat raw materials, energy and fuel costs were higher than anticipated for most of fiscal 2001, while competition was especially strong in the food service area and the meat snack business. The year 2000 was a good year for Bridgford Foods. Sales reached an all-time record level while profits were the second best in Company history. Lower profits were due to higher costs for raw materials, energy, transportation, petroleum based packaging materials and employee health care. New product and new customer development also contributed to increased expenses. It is a great pleasure to report that 1999 was a banner year for Bridgford Foods Corporation. New all-time record highs were attained in sales, earnings, dividends and capital. Net profits exceeded ten million dollars for the first time in our sixty-seven year history. 1998 was an outstanding year for Bridgford Foods Corporation. All-time highs were established for sales, earnings and equity. Favorable commodity costs, manufacturing efficiencies, tight cost controls and strong marketing programs all contributed to the greatest one year success in company history. Bridgford Foods Corporation's sales and earnings set new records in our 1997 fiscal year, the fifty-two weeks ended October 31, 1997. New efficiencies and increased productivity resulting from our capital expenditures for plant and equipment in 1995 and 1996 enabled us to earn $6.6 million in 1997, an all-time high. Sales set a new record for the eleventh consecutive year in 1996. Dividends were increased for the tenth year in a row. Three major capital improvement projects begun in our 1995 fiscal year, including the two largest in the Company's 64 year history, were completed with a total capitalized cost of $12,000,000. Net income for 1996 was $5.7 million, which reflects a decrease from 1995 due to extremely high raw material costs in both our meat and bakery divisions.